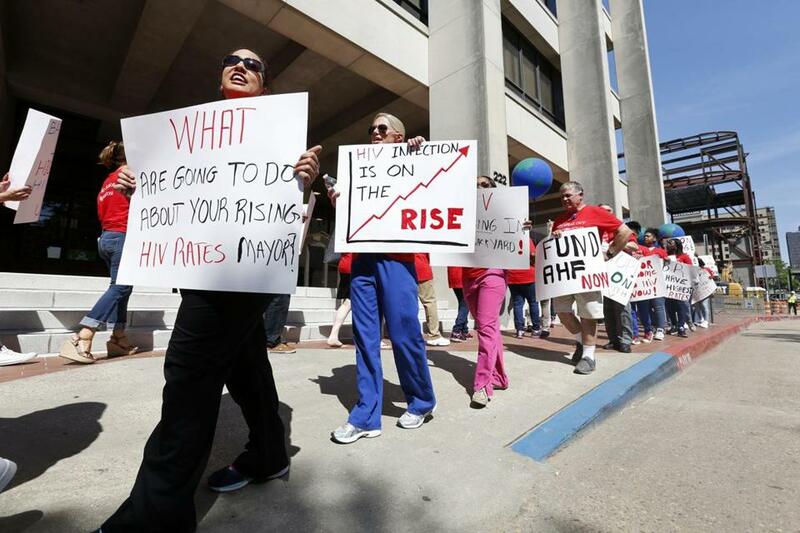 Community advocates in Baton Rouge protest outside City Hall against the defunding of two local community HIV clinics on April 13. Preoccupied with tweeting about witch hunts and poll numbers, Trump hasn’t even acknowledged this mass exodus — and that’s exactly the problem. With these resignations, the council lost nearly one-third of its members. Established in 1995, during the Clinton administration, PACHA makes recommendations to the secretary of health and human services concerning HIV/AIDS prevention, treatment, programs, and policies. As with everything Trump, his inattention should surprise no one. As a candidate, he claimed he would be a better champion for LGBTQ issues than Hillary Clinton, yet couldn’t even be bothered to meet with HIV advocates during his campaign. He chose as his vice president Mike Pence, whose public health funding cuts and opposition to needle exchange programs sparked a significant HIV outbreak among IV drug users when Pence was Indiana’s governor. The anti-Trump protests show an intensity we haven’t seen since the AIDS crisis. Read: Is LGBT Pride up to Trump’s challenge? On the day Trump was sworn in as president, the Office of National AIDS Policy website vanished and has yet to be replaced. In Trump’s world, that probably makes sense, since he hasn’t gotten around to appointing a director for that office. Trump, obsessed with comparing himself to his predecessor, might be interested to know that President Obama filled that position just over a month into his administration. Some may no longer believe that such an advisory council is even necessary. It’s a fact that people with HIV are living longer and healthier, and that AIDS is now viewed as a chronic disease instead of the death sentence it often was in the 1980s and 1990s. Yet the fight against the epidemic still rages, even as HIV/AIDS is treated like an afterthought because it no longer garners headlines. Communities of color are disproportionately affected. According to the Centers for Disease Control and Prevention, African-Americans accounted for 45 percent of new diagnoses between 2005 and 2014, while Hispanics equaled 24 percent. In 2015, gay and bisexual men of all races totaled 67 percent of 39,513 diagnoses. African-Americans, Hispanics, and gay and bisexual men — no wonder Trump feels he can ignore a disease threatening their lives and community. And that doesn’t even take into account all the ways that the president’s damaging replacement for the Affordable Care Act could affect people with HIV, 40 percent of whom receive care through Medicaid. Trumpcare has proposed steep cuts to the program. Ever since the first cocktail of protease inhibitors dramatically reduced AIDS mortality in the 1990s, activists have continually reminded us that this disease, which robbed so much from so many, isn’t over. Trump’s disinterest in prevention or treatment could bring dire outcomes. Those old enough to remember the plague years, when communities were decimated, know the unbearable cost of government apathy. Before Reagan first publicly mentioned AIDS in 1985, thousands were already dead. It could happen again. HIV diagnoses for gay and bisexual African-American men under age 24 increased more than 80 percent between 2005 and 2014. We can ill afford a president who, as Schoettes put it, “does not take the ongoing epidemic or the needs of people living with HIV seriously.” An administration that feeds on chaos and inaction may portend a frightening surge for a public health crisis that has always thrived on presidential indifference.